If you commonly experience pain in the ball of your foot when walking or running, a swollen and inflamed nerve called a Morton’s neuroma may be to blame. And while the name may sound rather ominous, a Morton’s neuroma isn’t a tumor, and in most cases it can be treated without surgery. Here’s an overview of the condition, its causes, symptoms and treatment options from NY-based orthopedic foot and ankle specialist, Stuart Katchis, M.D. A Morton’s neuroma is a condition affecting one of the nerves of the foot. 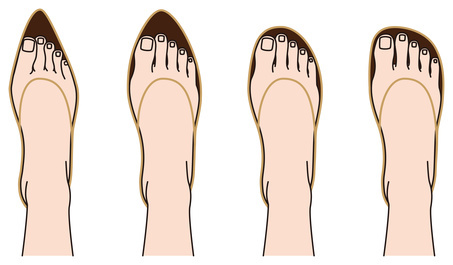 It most often involves the nerve between the third and fourth toes, but occasionally occurs between the second and third toes instead. It can be present in one or both feet, and results when the nerve is chronically compressed between the long bones of the foot, also known as the metatarsal bones. When this happens, the nerve becomes irritated and inflamed, causing pain. Prolonged compression actually leads to a thickening of the tissue surrounding the nerve, creating a fibrous swelling that results in even more nerve compression and discomfort. Anything that puts undue pressure on the nerve can lead to a Morton’s neuroma. It can occur due to the physical structure of your foot; having bunions, hammertoes, or flat foot increases your risk, and in some cases, the space between the foot bones is simply narrower for some people. However, poorly fitting shoes are the biggest risk factor. Tight shoes, narrow shoes, and high heels can all squeeze the foot and put it in an unnatural position, which can compress the nerve. Because of this, it may come as no surprise that women are 8-10 times more likely than men to develop a Morton’s neuroma. The pain from a Morton’s neuroma is often described as a sharp, burning sensation. Your toes may also burn or sting. Seeking treatment when you first notice symptoms of Morton’s neuroma is important. Ignoring the condition can leave you walking with a limp or even avoiding walking all together, effectively limiting your activities. The earlier you seek treatment, the better your outcome is likely to be. Fortunately, most symptoms of Morton’s neuroma resolve with conservative treatments, and surgery is usually unnecessary. If you wear tight, pointy-toed, high-heeled, or otherwise binding shoes, changing your footwear is a must. Wearing flats (or low heels) and roomy shoes with a wide toe box that lets your foot decompress may help to relieve symptoms. Rest – The most important component of treatment is stopping or reducing any activity that causes pain. Resting helps reduce the inflammation and let the nerve recover. Ice – As with most inflammatory conditions, you may be directed to ice the area to reduce irritation. Anti-inflammatory medications – You may be prescribed non-steroidal anti-inflammatory medications such as ibuprofen. Orthotics – Shoe inserts may be recommended to reposition your foot and change the distribution of weight. Cortisone injections – In some cases, your doctor may advise that you undergo a series of up to three cortisone injections to help resolve inflammation around the nerve before recommending surgery. Learn more about treatment options for Morton’s neuroma by visiting this page. If you’re experiencing any symptoms of Morton’s neuroma, you don’t have to live with the pain. Contact Extend Orthopedics for an appointment with Dr. Stuart Katchis by calling (212) 434-4920 or schedule your consultation online today.